One of these four Martian addresses could be the place where a European rover lands in 2019. European space officials are eyeing four possible landing sites on Mars for a life-seeking rover set to launch toward the Red Planet in 2018. All of the potential ExoMars rover landing sites are located near the Red Planet's equator, where ancient exposed rocks could reveal clues about the wet past on Mars. "The present-day surface of Mars is a hostile place for living organisms, but primitive life may have gained a foothold when the climate was warmer and wetter, between 3.5 billion and 4 billion years ago," Jorge Vago, ESA's ExoMars project scientist, explained in a statement. "Therefore, our landing site should be in an area with ancient rocks where liquid water was once abundant. Our initial assessment clearly identified four landing sites that are best suited to the mission's scientific goals." The scientific community was asked to propose possible landing sites for the ExoMars rover in December 2013. ESA officials said that there were four clear front-runners of the eight proposals considered during a workshop. 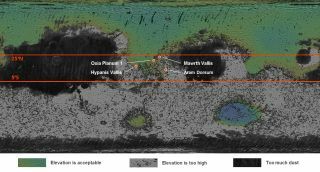 Now an ESA-appointed panel has officially recommended those sites — Mawrth Vallis, Oxia Planum, Hypanis Vallis and Aram Dorsum — for further analysis. Those next steps will include simulations to assess the probability of landing success. An artist's illustration of the European Space Agency's ExoMars rover on the surface of Mars. The ExoMars rover will launch in 2018 to explore the Red Planet. The vast rock exposures at two of the possible landing sites — Mawrth Vallis and nearby Oxia Planum — are more than 3.8 billion years old and they're rich in clay, a material that hints that water once flowed over the landscape. The rocks, which have varied compositions, were exposed by erosion only within the last few hundred million years. That's relatively recent compared to the exposure date for other rock layers on Mars, and scientists hope the rocks are still well preserved against damage from harsh radiation and oxidation. Hypanis Vallis, meanwhile, lies on an area that's thought to be the remnant of an ancient river delta with distinct layers of fine-grained rocks deposited about 3.45 billion years ago. Lastly, the Aram Dorsum area is bisected by a channel surrounded by rocks that are thought to be sediments deposited much like those around the Nile River, according to ESA scientists. "While all four sites are clearly interesting scientifically, they must also allow for the operational and engineering requirements for safe landing and roving on the surface," Vago added in a statement. Mission managers hope to make a final decision by 2017.